The Society for East Asian Anthropology awards the 2017 Ted Bestor Prize for Outstanding Graduate Paper to Gil Hizi for his paper “Marketized ‘Educational Desire’: Shifting and Reproduced Meanings of High-Education in Contemporary China.” Hizi is a PhD candidate in anthropology at the University of Sydney, Australia. 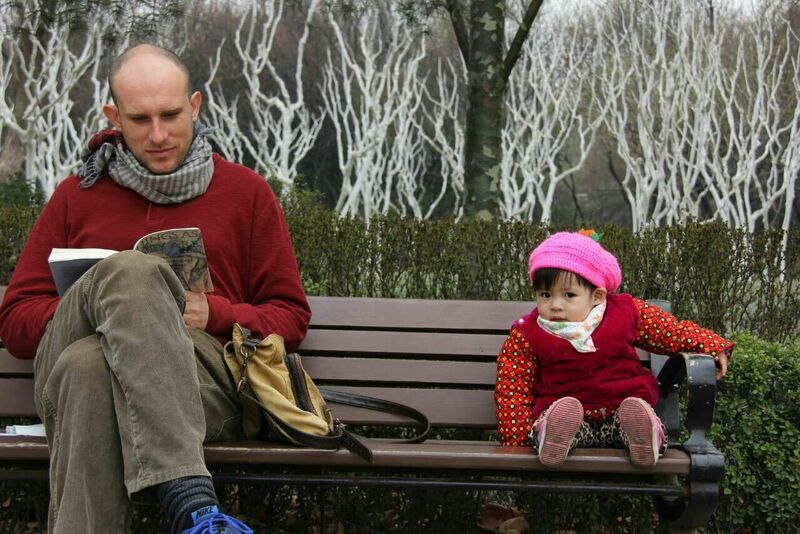 Gil Hizi is reading in Hundred Flower Park in the Center of Jinan, China. Gil Hizi. The 2017 Ted Bestor Prize also had two honorable mentions. 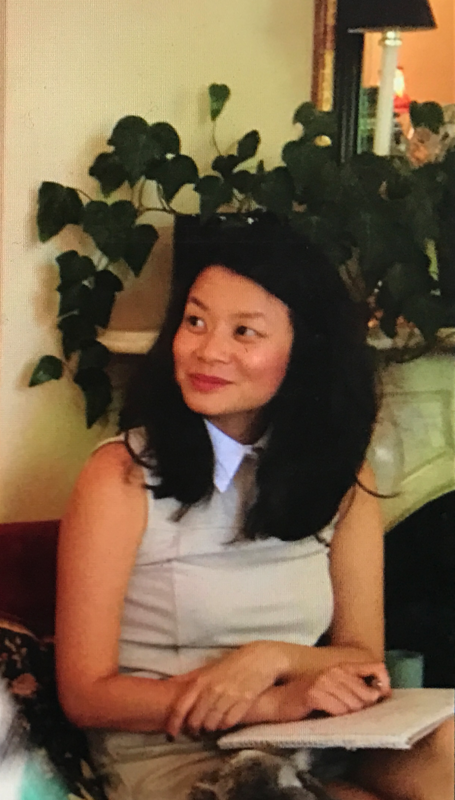 Victoria Nguyen, a PhD candidate in anthropology at the University of Chicago, was awarded honorable mention for her paper “Slow Construction: Alternative Temporalities and Tactics in the New Landscape of China’s Urban Development.” James Wright’s paper “Tactile Care, Mechanical Hugs: Japanese Caregivers and Robotic Lifting Devices” received another honorable mention. James is a PhD candidate at the Hong Kong Institute for the Humanities and Social Sciences, University of Hong Kong. Named after the first president of SEAA, the Theodore C. Bestor Prize is awarded annually for the best graduate student paper on any aspect of East Asian anthropology and/or East Asian anthropology’s contribution to the broader field. Glenda Roberts (SEAA President and Professor at the Graduate School of Asia-Pacific Studies of Waseda University) chaired the 2017 Bestor Prize Committee, which included Andrew Kipnis (Professor of Anthropology in the School of Culture, History and Language of the College of Asia and the Pacific at the Australian National University) and Jenny Chio (Assistant Professor of Anthropology at Emory University). Award Citation: “Educational Desire” gives us the opportunity to think about education in China beyond existing models. Hizi’s detailed and thorough ethnographic accounts with university students in Shandong reveal how the university years are now seen as a life experience. University is a kind of lifecourse stage for young Chinese adults after they pass the entrance exams but before they must face what students see as a tough world of employment, based on guanxi relationships and “hidden regulations” (qian guize). Into the breach steps the ethos of entrepreneurship, which universities are very much encouraging, to paraphrase Hizi, by allowing students to probe and engage with the uncertainty of the outside world without facing the risk of failure. Meanwhile, they maintain their autonomy as students while gaining confidence as “entrepreneurs of the self” (in Rose’s 1998 sense), in projects that connect them to the larger society. Hizi skillfully frames this development by pointing out that although governmental policy expanded the number of universities, this did nothing to dampen families’ desires for their children to enter top universities. The numbers of degree holders increase year to year, yet the job market fails to meet expectations. Students end up feeling perplexed about how to maximize their time in university so as to do as best they can after graduation. Into this dilemma comes entrepreneurship, which soothes students’ qualms “by encapsulating a sense of meritocracy and competence.” Needless to say, universities such as the one studied by Hizi are wholeheartedly embracing this trend to foster entrepreneurial skills. We congratulate Gill Hizi for submitting a well-conceptualized, highly informative paper with fresh insights, based on his thorough ethnographic research, and founded solidly in the extant literature. Award Citations: In “Slow Construction,” Victoria Nguyen introduces us to the politics of resisting urban redevelopment in contemporary urban Beijing. At the moment of her research, poor elderly residents successfully resist relocation by refusing to accept compensation packages. Some pursue packages larger than the developers are willing to give, but others seem motivated by little other than a “non-instrumental obstructionism,” a desire to continue living in their decaying but memory-filled neighbourhoods. Retired, accustomed to homes that others might consider dilapidated, and with time to kill, the resistors revel in the slowness of their tactics, frustrating the developers and their deadline-filled, fast temporalities. Beautifully written and full of evocative photographs, this essay successfully inserts a temporal dimension to the space-obsessed ethnography of urban redevelopment. The Hug in action. The carer on the left who is operating the Hug is wearing a support belt after suffering a herniated disc, which he attributed to transferring residents. James Wright. Award Citation: We are very happy to give an honorable mention to James Wright’s lucidly argued paper, titled “Tactile Care, Mechanical Hugs: Japanese Caregivers and Robotic Lifting Devices.” In this ethnographic case study of technology, human physicality, and techniques of care in a Japanese elderly care home, Wright thoughtfully weaves gently humorous vignettes of the implementation of a robotic lifting device called “The Hug” with an analytically sharp perspective on social and affective practices of care-giving and their implications for state efforts to “reform” elderly care. 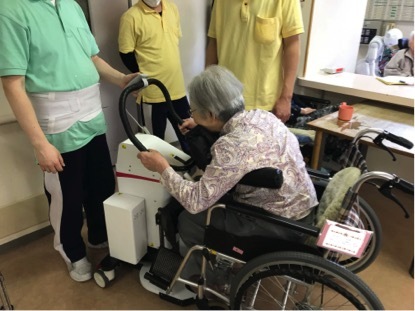 He argues that the resistance of staff members to such devices, while intended to help relieve the physical strain of lifting residents, illuminates persistent social values associated with touch, proximity, and compassion that undergird the relational work of care-givers. In so doing, Wright convincingly presents a complex narrative of human to technology to human relations that reveal the social negotiations at the heart of all technological innovations.